Over time, decks suffer both minor cosmetic issues and major structural problems that can significantly affect their function. Let’s take a look at some problems and fixes you can do. Common problems that can occur to your deck are weather, type of materials used, actual construction, and insects. 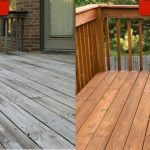 We will be discussing how to identify these in another post, but for now, be aware that there are problems that affect your deck condition outside your control, however, some, like materials and construction, can be well within your means of control. 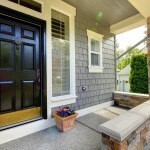 A well-maintained deck adds both form and function to your home. Over time, however, several factors contribute to wear and tear, giving homeowners a choice between full-on replacements or attempting deck repair, including deck staining. So which do you do? 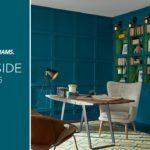 As long as your boards are sound you could paint or stain them again. We had an old front deck that looked bad, however, the boards were in decent shape and didn’t feel replacing them was necessary at the time. 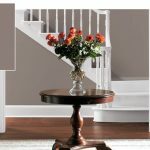 We sanded down rough edges and had professionals come in and re-stain it. 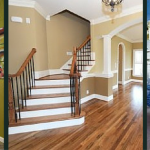 If your deck is more than 16″ off the ground and the boards are not in the best of shape, be leary of board breaking and cautious of being able to carry weight. Check the beams and joists for stability and if you see cracks vertically, it may be time to replace the base posts. 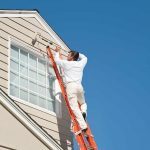 If you see a lot of checking, splitting, and board movement recessing screws, it may be time to replace the deck completely. If you also see screw hole rust, I would be wary of having too much weight on the deck in the meantime. You can try poking boards with an awl or ice pick, is it soft in numerous places? This is a sure sign of rot from water damage. If it was mine, I would replace it. At least the badly split ones. If the “splits” aren’t very deep (mostly or all the way through the board) then it’s what is referred to as “checking”, which is normal….unfortunately. Checks differ from actual splits in that they aren’t as deep but can be very numerous. If you are using 5/4 x 6 pressure treated southern yellow pine deck boards that are the common decking used many places. 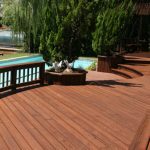 Checking is a normal process of any grade of this type of decking. The higher grades generally just have fewer knots and imperfections. Make sure your professional who replaces the boards do a good job by creating a level deck, plumb railings, nice cuts, uses proper nails/screws/brackets all around. I normally practically insist on a better grade of wood to help with the longevity and lifespan on my deck. 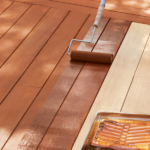 If you are on a tight budget and are unable to replace the deck completely or even some boards, consider going to your local rental center and get a “square buff” sander and give the deck a good sanding. If any boards are spongy or feel soft, you will need to replace them as they are not stable or safe. You can stain and finish to your preference. THIS IS A SHORT TERM SOLUTION. Eventually, you will need the deck boards replaced the longer you wait for the more likely you will be looking at replacing the joist as well (which will increase your spend).